America is a scary place! It always bugs me that when things go wrong in the world, many nations expect America to do something. When we do something, the US gets blamed and vilified hence why many Americans like me no longer care about global problems. Even worse with this mindset is when foreigners opine about American politics and make ignorant statements. 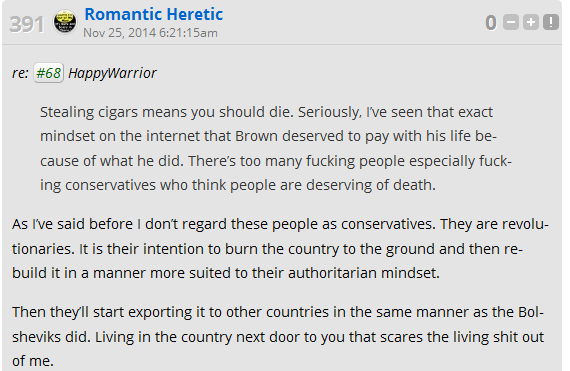 Canadian LGF poster Romantic Heretic says American conservatives scare him. He claims conservatives are revolutionaries and seek to export this revolution around the world. If Romantic Heretic finds American conservatives scary, well then stay in Canada and mind his own business. As for exporting revolution other than the nation building loving Neocons who are not conservatives, I do not know anyone on the right pushing to export revolution. No one is forcing this Canadian to follow American politics. He should stick to watching hockey.